Sanatec® HDPE has a specially designed solid textured finish that is durable, super scratch-resistant and easier on knife blades. Available in a wide array of colors, Sanatec's HDPE (high density polyethylene) formulation is non-porous and dishwasher safe and will not absorb moisture, bacteria, or odors. The hard surface will not chip, crack or splinter and can endure low temperatures and freezer applications. Colors include natural (a white shade), blue, green, red, beige and yellow. Sanatec® Lite HDPE uses co-extrusion technology to give it a solid outer skinned surface with a closed-cell foam core that won't absorb moisture. With 1/3 the weight of solid HDPE, Sanatec Lite represents an opportunity for cost savings without sacrificing performance. It is available in a natural matte color. 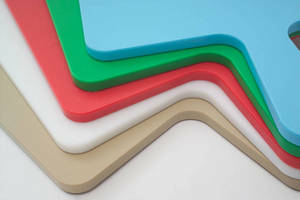 Sanatec® PP is a polypropylene option with a hard surface and improved stain resistance. This tough surface material has a higher temperature performance of up to 212 degrees F. It is available in a natural matte color. Sanatec products make it easy to be clean and they're microbe-free. Even cleaning fluids wash off easily without leaving a residue. Available in many thicknesses and sheet sizes, Sanatec products have a durable surface that can stand up to the continuous impact of chopping and cutting or the repetitive machinery of food processing equipment. Visit www.vycomplastics.com to download a brand new Sanatec brochure. With a 25-year legacy of product quality, Vycom recently launched a "family" approach of grouping products by application, making selection and purchasing easier for customers. The company now has six distinct product families serving a diverse mix of markets. In addition to Sanatec, other Vycom products families include: Corrtec chemical and corrosion resistant materials, Flametec® clean room and semiconductor fire safe materials, Celtec® graphic/display boards for inside and outdoor applications, Seaboard® outdoor furniture and marine components, and Playboard® sheet for modular recreational and playground systems.